A proposal by NHTSA would allow automakers to install and enable adaptive driving beam headlights on new cars. With apologies to Bruce Springsteen and Manfred Mann the days of being "Blinded by the Light" may be numbered. After years of pleading from global automakers, led by Toyota, NHTSA announced this month that it is considering a dramatic change to the long-standing rules that govern automobile headlights. If approved, the change — currently in a comment period before official review — would allow automakers to install and enable adaptive driving beam headlights on new cars sold in the U.S. Put simply, adaptive driving beam headlights make it possible to drive with high beams on without having to worry about blinding other motorists. The high-tech headlights continuously modify and redirect the light coming from each headlight, moving it away from the gaze of oncoming motorists and pedestrians — and the rearview mirrors of vehicles ahead — while better illuminating areas where no vehicles are present. "In our opinion, it would make a really big difference" to allow adaptive driving beam headlights, said Matthew Brumbelow, a senior research engineer with the Insurance Institute for Highway Safety. "The main balancing act with headlights in general is achieving good visibility for your vehicle without glaring everyone else on the road. Typically, that's done with low and high beams, and for the most part, that's been left to people to decide which is appropriate." The problem, Brumbelow says, is that most people underuse their high beams. In a study of high-beam use, IIHS found that 80 percent of drivers fail to turn on their high-beam lights when they should. A study by the Insurance Institute for Highway Safety found that most drivers fail to use their high beams when they should. While the technology is in use in other markets, including Europe, its rollout in the U.S. has been stymied in part by Federal Motor Vehicle Safety Standard No. 108, an equipment standard dating to 1967. The rule regulates not only how headlights put out light, but also where they must be located on a vehicle. NHTSA has amended the standard before, including a change about 40 years ago to allow for brighter high-beam lights, as well as other changes to reduce glare from oncoming vehicles. In 2013, with highly controllable LED lighting and front-facing cameras and sensors opening up opportunities for automakers, Toyota asked NHTSA to take another look at its lighting equipment standard to see if it permitted adaptive driving beam headlights that the Japanese automaker wanted to install on its vehicles. It didn't, but it probably should, the agency ultimately found. Over the intervening years, NHTSA commissioned studies of the technology and its benefits, solicited comments from automakers and others, and sought ways to implement adaptive driving beam headlights and test their effectiveness. Audi's matrix system, right, employs a number of LEDs that are switched on and off, depending on the driving scenario. Automakers haven't sat idly by. They've begun putting the building blocks in place to turn on adaptive driving beam headlights as soon as regulations allow. Audi, for example, equipped its redesigned 2019 A8 sedan with adaptive driving beam headlights that use a series of LEDs to shape the light emanating from each headlamp, although the feature won't be enabled — via a software update — until NHTSA decides on its proposed rule, an Audi spokesman told Automotive News. 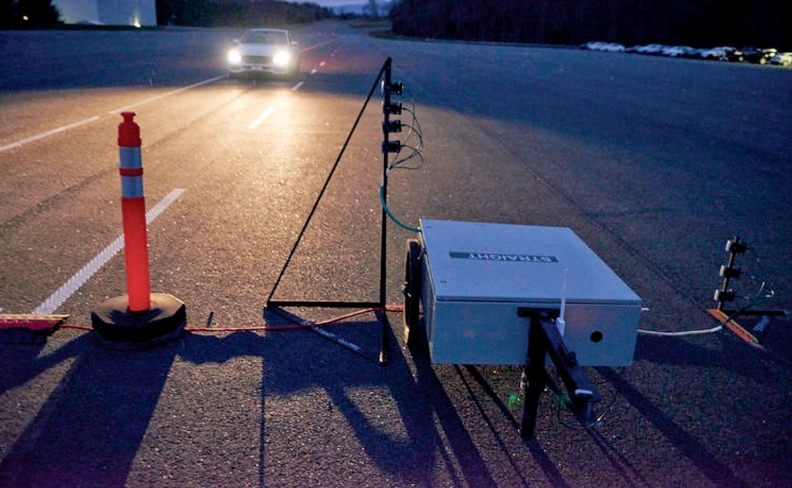 Though not yet legal to deploy, automakers have used different technologies to make their adaptive driving beams work. Audi uses what's called a matrix lighting system in the A8, made up of a number of LEDs that are switched on and off to create different patterns as the need arises. Other automakers employ a mechanical shade over portions of the bulb to direct light. Regardless of the means, every automaker with adaptive driving beam technology relies on sensors to detect other vehicles and pedestrians. 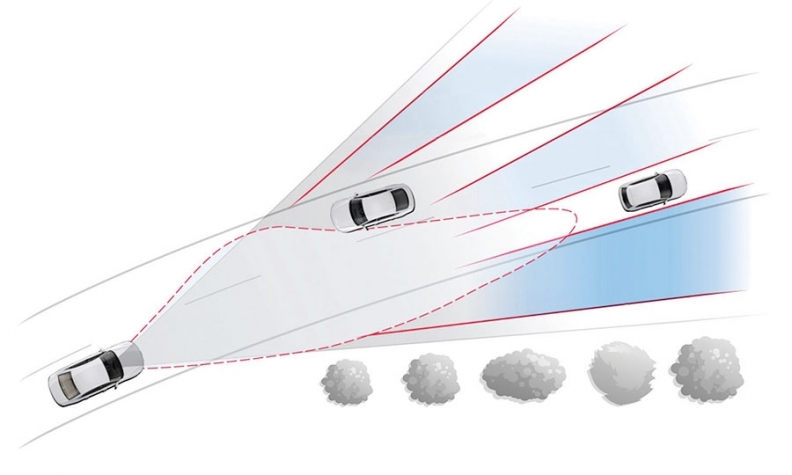 This illustration from Audi shows how adaptive driving beams, such as those in the A8, work. The A8's front-facing camera identifies the location of oncoming and preceding traffic. Software continually adjusts the output of the car's LED matrix headlights to brightly illuminate regions of the road away from other vehicles, while reducing light output aimed at other vehicles. 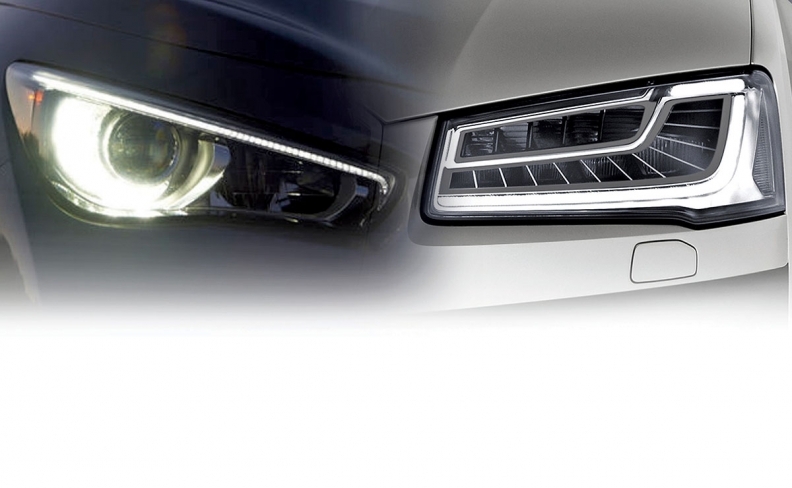 The result is better illumination for the car's driver and greatly reduced glare for others. 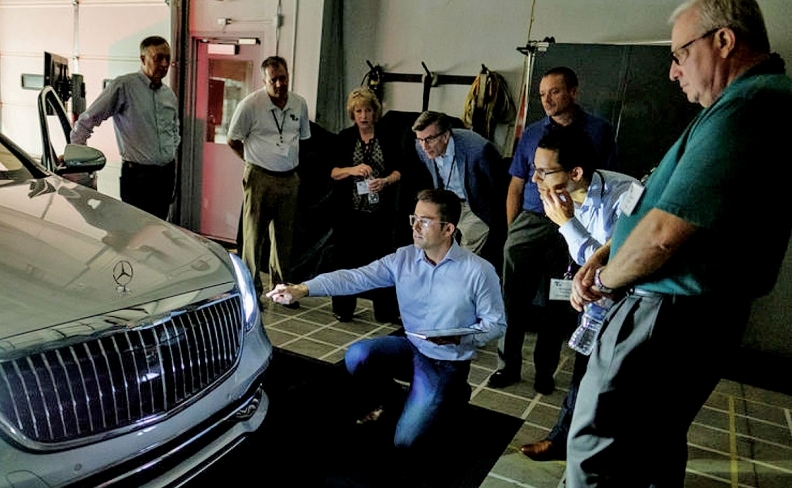 As with other technology advances, Brumbelow said, the costs of adaptive driving beam lighting will likely limit its application to luxury vehicles initially. "A lot of vehicles already have most of the necessary technology in them," he said. "It uses the same camera, for example, as is used for adaptive cruise control. The main costs will be going to a multiple LED headlight. Eventually, it will be an option that you should be able to get on more [mass-market] vehicles."